JUKEBOXES . 10 Postcards in folding wallet 1975. Printed by John Krivine and Simon Burstein at the Kinsman Morrison Gallery. London. Catalogue design by Barney. The Postcards were produced to accompany an exhibition by Messrs Krivine and Burstein, following two years work, salvaging Juke Boxes from a Virginian “Juke box graveyard”. The machines were restored by Acme Attractions, London U.K. and exhibited at the Kinsman Morrison Gallery, London in the Summer of 1975. The Postcards form a fold-out perforated zig zag book within a printed card wrap. 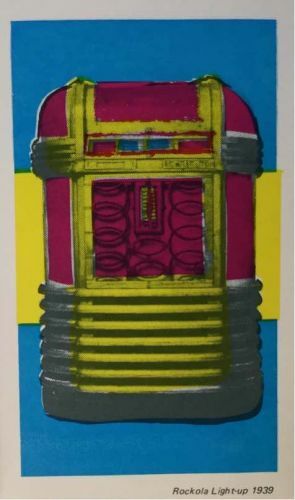 Two of the cards feature black and white images of Juke boxes being smashed ,or being installed/removed, whilst the remaining eight cards show Juke Boxes, Printed In Warhol-esque colours and style, absolutely pinning the zeitgeist of the mid 1970’s. The cards are in Fine condition, the wraps a little toned and rubbed to the edges. A rare survival-most decorative.